People frequently ask me for native plant suggestions for their summer gardens. Below are some recommendations for shrubs that will provide a lot of visual interest in the form of beautiful flowers or fruits, as well as food and habitat for birds, butterflies, bees, and other wildlife. 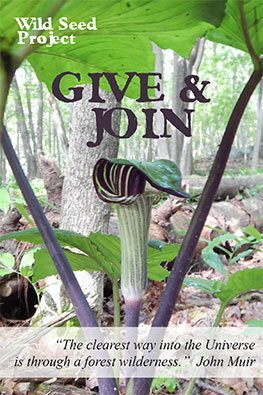 Adding some native species to your landscape will immediately begin attracting the fauna that are part of Maine’s unique landscapes, something that an exotic garden plant, no matter how lovely, just cannot do. 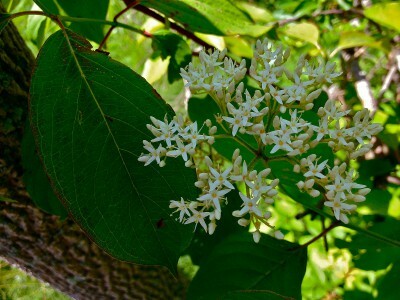 Try planting one or more of these native flowering shrubs and see what starts to happen! For urban residents, many of these shrubs will also grow well in a large planter. Here is the collection organized by bloom time. All photographs by Lisa Looke except where noted. An understory family of shrubs found on roadsides, blueberry barrens, and acidic, dry-to-moist woodlands. Small, bell-shaped white flowers appear in late spring and mature in the summer to delicious blueberries. The arching stems are beautiful, and the summer foliage is a blue-green that turns deep red in fall. The flowers are an important nectar source for pollinating bees, and the fruits are a joy to humans and birds. 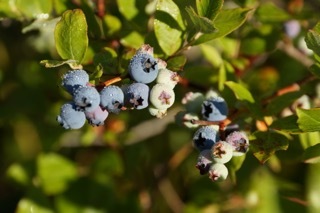 Highbush blueberry prefers moist humus-rich soil, while lowbush blueberry will thrive in drier soils. These shrubs will thrive in sun to shade and in soil that is moist to dry, depending on the species. Different species range in height from 1 to 6 feet. A wonderful shrub that belongs in every garden, large or small. 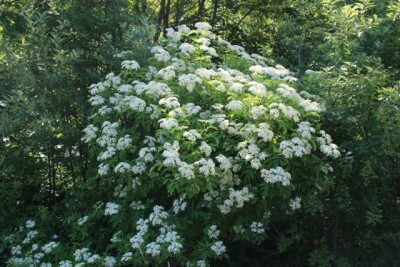 In early summer, creamy white flower clusters cover the ends of this multibranched shrub, then mature into dark blue berries by late summer. The individual leaves are pleated and serrated, giving a distinctive texture to the garden. Arrowwood makes a great hedge or specimen. It grows in sun to part shade and moist to dry soil. Grows to 6-8 feet. A large, multistemmed shrub that creates a dramatic backdrop to a garden or nice specimen on its own. Creamy white flower clusters are set against glossy green foliage in early summer, followed by berries that attract many birds. 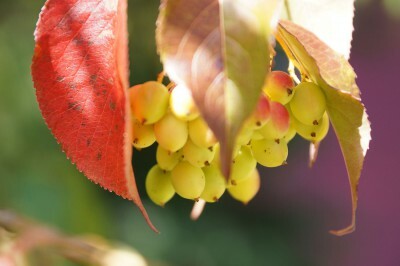 The berries turn from yellow to orange to red to black as they ripen. 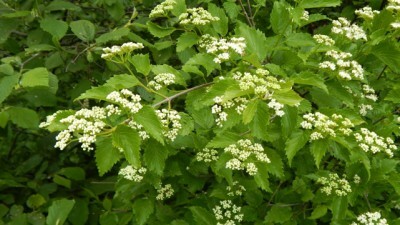 Nannyberry is found on roadsides, thickets, and wetland edges. It grows in sun to part shade, in moist to dry soil. Grows to 8-12 feet. 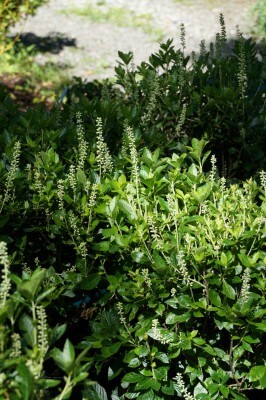 A small to medium-sized shrub that has shiny green foliage with coppery overtones. Small, delicate yellow flowers are produced over a long period in summer and are an important source of nectar for bumblebees. 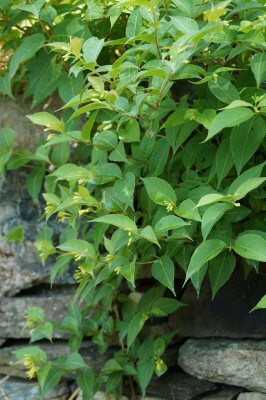 Honeysuckle thrives in difficult environments, such as along roadsides or sidewalk strips, in any light level. It is a plant of edge habitats that enjoys sun or shade and medium to dry soil. Reaches 1-5 feet, depending on location and pruning. Our native rose has lovely 1½-inch pink flowers followed by ½-inch red hips and shiny green foliage. This shrub spreads by underground roots, so it needs restriction in a small garden. It thrives in the most difficult locations and is tolerant of dry, infertile soil, salt spray, and abuse from the snow plow. Its only demand is bountiful sunshine. It is found in roadsides, meadows, and dry hedgerows and thrives in sun and dry soil. Grows 1-6 feet, depending on location and pruning. 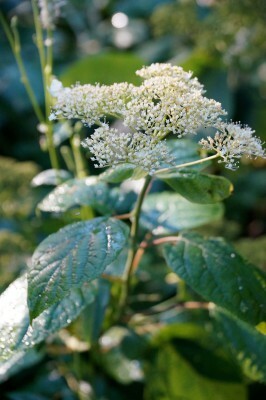 A small mound of green textured foliage is covered with upright rounded white flower clusters in summer. The plant attracts a multitude of butterflies, bees, and birds. The foliage is an important food source for the spring azure butterfly and was used by colonists as a tea substitute during the revolutionary war. 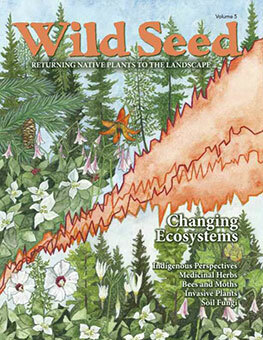 It is a fire-adapted species common in the prairie states that fixes its own nitrogen from the atmosphere with the aid of bacteria in its roots. 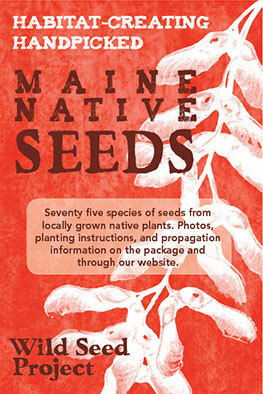 It is a rare species in the wild in Maine, but it is easily propagated and sold in discerning nurseries. Sun, dry soil. Grows 2-3 feet. The last northern azalea to bloom with fragrant white tubular flowers on an open, deciduous shrub. A rare species in the wild in Maine in moist to wet woodlands, it is more common farther south but is very easy to cultivate in a garden. Part to full shade, moist, soil high in leaf mold. Grows 5-6 feet. Creamy white flower clusters are followed by showy blue fruits in mid summer. A large shrub with a rounded crown spreads by suckering to form a large colony. Great plant for a hedge or large area providing a dramatic effect. Found growing in roadsides, meadows and shorelines. Prefers sun to part shade, average moisture soils. Grows to 6-8 feet in a thicket. 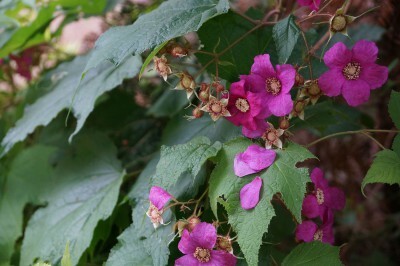 Showy 2-inch purple-pink flowers bloom on an attractive mid-summer blooming shrub. Large maple-shaped leaves stay a fresh green all season. The shrub forms a nice colony or hedge, so give it space for a lovely low-maintenance mass of foliage and blooms. Many insects pollinate the flowers; birds and people relish the fruits. Found growing in woodland edges, roadsides, and hedgerows. Sun to shade, medium moisture soil. Grows 4-5 feet tall. 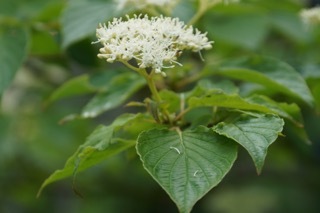 A dramatic native shrub with upright branches covered in mid-summer with large flat-topped clusters of white flowers followed by deep purple fruit. Pollinating bees and other interesting insects are attracted to the flowers, and the hollow stems provide overwintering habitat for their larvae. Birds and people eat the berries. Found growing in wet meadows, hedgerows, and roadside ditches, the shrubs grow in sun to partial shade, and medium to wet soils. Grows 8 feet in sun and up to 12 feet in high moisture or shade. 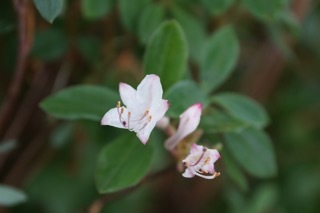 A low shrub with attractive light-green foliage that produces frothy clusters of white to pale-pink flowers in mid-July. Meadowsweet thrives in a formal garden or more wild style planting. The plant hosts the larval stage of the Spring Azure butterfly. It is found in roadsides and meadows in moist to dry soil and sun to part shade. Grows to 3 feet. 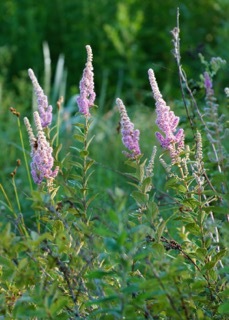 In late July, rosy-pink steeple-like flower stems cover this small native spiraea. Foliage is hairy and turns a golden bronze in fall. Steeplebush makes a lovely small specimen or low hedge. It attracts butterflies, bees, hummingbirds, and birds and is an important host plant to the Columbia silk moth. It grows in wet to dry meadows, roadsides, and ditches, in sun to part shade. Grows to 3 feet. Bayberry is a tough native shrub for dry, gravelly, or sandy soil and coastal locations. It fixes its own nitrogen from the atmosphere with the aid of bacteria in its roots. Tiny yellow early-spring flowers mature into waxy gray berries in late summer that are relished by birds and used to scent candles. The foliage can be used as bay leaves fresh off the plant or dried for winter use. 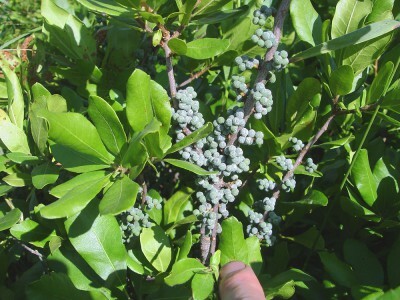 Bayberry is found along the coast and is tolerant of sea spray and road salts. It grows in sun and dry soil to 3-6 feet. Towards August this fragrant shrub burst into bloom with delicate spires of white flowers that continue to bloom for an extended time. Pollinators buzz and flutter around the blossoms and the rich green foliage gives the plant a handsome rounded stature. 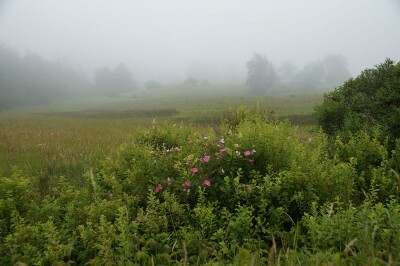 In the wild, it is a shrub of coastal wetland edges and moist woods. It is common in southern New England but rare in Maine, though widely propagated in nurseries. In the garden, it thrives in sun to deep shade in moist soil to 3-6 feet.